Nils Flaaten fra importør selskapet Flaaten Vin ble igår tildelt Riesling Fellowship Award i Berlin. I 32 år har Nils Flaaten drevet import selskapet Flaaten Vin, som ble grunnlagt i 1893. Han har utviklet firmaet til et av de viktigste importør selskapene i hele Norge. Etter å ha sluttet seg til familiebedriften i 1987, ble han den første vinhandleren i Norge til å inkludere Mosel Riesling fra berømte tyske eiendommer i sin portefølje. Idag har han 60 viner fra ulike tyske vinregioner i sin portefølje. On the 1st April at the Berlin Reichstag, the German Wine Institute (DWI) awarded the four new Riesling Fellows Lars Daniëls from the Netherlands, Nico Knott from Belgium, Nils Flaaten from Norway and Tomasz Prange-Barczyński from Poland for their international services to the Riesling and the German wine category. "Their notable work to enhance the image and reputation of the leading German grape variety outside Germany makes them obvious choices to be included in the circle of distinguished Riesling Fellows, which is now 30 worldwide," said Monika Reule, Managing Director of the DWI. She celebrated the four new Fellows together with the German Wine Queen, Carolin Klöckner. The German Wine Institute has been honouring Riesling Fellows in Europe, the USA and Asia since 2013.Yesterday, for the first time, the awards ceremony took place in Berlin and celebrated a circle of Riesling Fellows which now includes 30 personalities from 10 different countries. 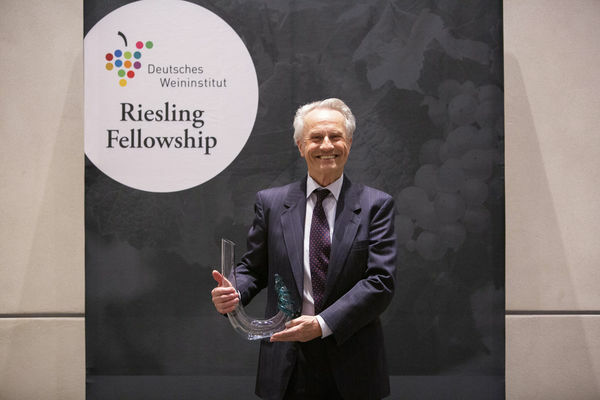 Seven current Riesling Fellows, together with a number of Generation Riesling winemakers and over 40 wine experts from all over the world, attended the awards ceremony in the Reichstag. The awards ceremony was also attended by distinguished guests and notable governmental representatives: Andrzej Pryzylebski (Ambassador of the Republic of Poland), Junhui Zang (Minister of the People's Republic of China), Kenichi Matsuda (Minister of the Japanese Embassy), MdBs Gustav Herzog (patron of the event) and Jan Metzler.